Discussion in 'Antennas, Feedlines, Towers & Rotors' started by W9XMT, Oct 29, 2018. For discussion: Posts have been made on various boards to the effect that the elevation pattern of a vertical monopole requires reflections from the ground plane some 10 to 100 wavelengths downrange from the monopole before that pattern takes its final shape. Below is a NEC4.2 analysis of the elevation pattern of a vertical monopole, for the conditions and with the observations included in that graphic. The vertical plane (far-field) pattern in that graphic is fully formed at a horizontal distance of less than 10 wavelengths, with its peak gain at 35° elevation. 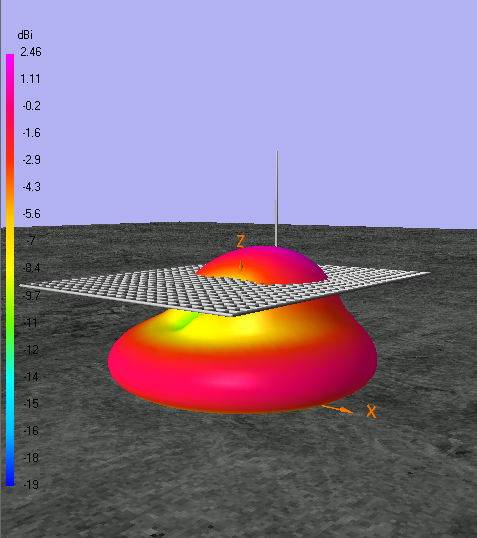 The reduced low-angle radiation seen there is the result of excluding the surface wave in the analysis. The surface wave analysis (left side of graphic) for the same horizontal distance shows that the maximum radiated field from this system lies in the horizontal plane, not at 35° elevation. Low-angle fields shown in the surface wave plot down to about 5° elevation (87.5 meters on the left-hand vertical scale) can propagate at a decay rate of 1/r, which under the right conditions can reach to and reflect from the ionosphere, returning to Earth as skywaves. Note that gain shown for a 5° elevation angle in the space-wave plot are much lower than in the surface-wave plot. Theory shows that elevation patterns radiated (launched) by all base-driven, vertical monopoles of 5/8-wavelength height and less have maximum relative field [E/E(max)] in the horizontal plane for distances of about 1/2 to several wavelengths from the base of the monopole — regardless of the conductivity of the ground plane they are driven against. All of your postings seem to suggest that vertical antennas should work better than predicted by NEC2, which underestimates how much they radiate at very low angles. Further, you seem to be making the case that if installed over dry, sandy soil, a vertical will still work because low angle radiation is less effected by the earth out to a few tens of wavelengths out from the base of the antenna. I believe that the reason is the very poor soil I live on. Can you address that issue? ... All of your postings seem to suggest that vertical antennas should work better than predicted by NEC2, which underestimates how much they radiate at very low angles. What I observe, and state in my posts is that neither NEC2 nor NEC4 accurately will show all of the radiation from a vertical monopole if its surface wave is not included in the analysis. 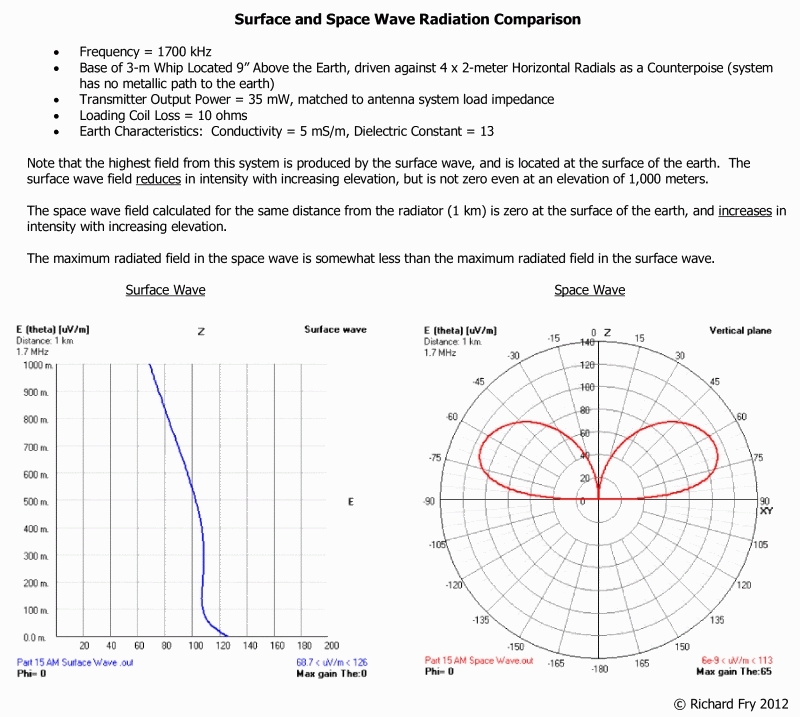 A significant amount of low-angle radiation in the elevation plane is not shown if/when surface wave radiation is not considered. ... So far, none of your postings explains why my verticals have never lived up to the predictions in ON4UN's book (or the ARRL Antenna Book). Specifically, take 40meters. I have the ability to rapidly switch between a vertical, elevated 0.17 wl, on a very dense ground plane and a resonant 1/2 wl dipole 0.42wl agl. The signal strength on the dipole beats the vertical by at least 3db 90% of the time. The SNR is always better on the dipole. I re-confirmed these observations on all the DX stations I heard just yesterday during the contest... I believe that the reason is the very poor soil I live on. Can you address that issue? MoM software is capable of very accurate design and analysis of antenna systems that are accurately modeled, containing no segment or geometry errors in violation of the MoM code in use. Its results are accepted by the FCC in the design and authorization of the radiation patterns of directional arrays the FCC requires of many AM broadcast stations, and which performance was verified by measurement with calibrated field intensity meters before the full-power commercial use of such arrays was/is permitted. I am not particularly interested why MOM doesn't model verticals very well. I would like to know why the actual performance of a vertical for DX isn't significantly better than a dipole? Most of the published data suggests it should be. Most of the published data is for better soils than I seem to have here. Is that what causes the difference? IIRC, your vertical is installed atop an airplane hanger. Are you modeling the complete system, including its installation environment? I remember starting and posting somewhere a NEC4 model of your vertical, based on your posts (see below). Its radiation pattern doesn't much match that of the textbook theoretical pattern of a series-fed monopole with its base at the surface of the earth. But then, it could be accurate for that installation configuration. I am measuring the complete system. I am only interested in modeling if it explains why the measured performance of the vertical compares so poorly to the reference dipole. I am only interested in modeling if it explains why the vertical compares so poorly to the reference dipole. NEC modeling will give the right answer only when the model defined for it matches the physical system being investigated, and NEC is understood/used properly. "...The far field pattern of any antenna is formed many wavelengths out from a point directly under the antenna, so there is no way you can build a radial field (ground plane) that extends far enough to make any difference, since the typical radial field only goes out 1/4wl. The only thing that is going to make a difference is the conductivity of the dirt from the edge of the radial field to about 50wl out from the antenna. ..."
"The contentions quoted above are not supported either by antenna theory, or by the measured tests of Brown, Lewis and Epstein of RCA Labs back in 1937...."
and then goes on to post a simulation which does not show any information that is useful to Hams, or if it does, its relevance is not explained. Richard's simulation is not relevant to Ham Radio users of vertical antennas, which do not care about field strength at ground level (very low angle) at any distance from the antenna. His sim might be useful to AM broadcasters which care only about field strength between zero and ~1degree above ground level. I don't have the BL&E paper, but I suspect it was written for the Broadcast Industry, not for Hams. Hams are interested only in how much a given antenna radiates at more than ~3 degrees above the horizon, and how the environment surrounding the antenna effects that. If you are interested in reading up on this topic, I refer you to the ARRL Antenna Book (21st Ed. ), Chapter 3, The Effects of Ground, pages 3-1 to 3-15. Too much information to reproduce here, but I select the following quote: "The degree that a vertical works better than a horizontal antenna a low elevation angles is largely dependent on the characteristics of the ground around the vertical,..."
Another quote, this time from ON4UN's Low-Band DXing (Fifth Ed. ), Chapter 9, Vertical Antennas, pages 9-1 to 9-28: "Conclusion This information should make it clear that a vertical may not be the best antenna if you are living in and area with very poor ground characteristics. This has been widely confirmed in real life. Many top-notch DXers living in the Sonoran desert or in mountainous rocky areas on the US West Coast swear by horizontal antennas for the low bands, at least on 80 meters, while some of their colleagues living in areas with rich fertile soil, or even better, on such a ground near the seacoast, will be enthusiastic advocates for vertical antennas and arrays made of vertical antennas." So, Richard, perhaps you should save your advice for the Broadcast Industry, and learn something about Ham Radio! ps: the following Google search gets more stuff than you can stand to read:"Effect of soil quality on far-field antenna patterns of vertical antenna"
re: "I would like to know why the actual performance of a vertical for DX isn't significantly better than a dipole?" I get better results using a vertical loop vs a dipole on 80 meters. This is to Europe.